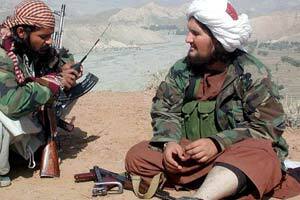 Described by Pakistanis as a "most wanted" Taliban commander, Abdullah Mehsud operates out of South Waziristan and is best known for masterminding the October 2004 kidnapping of two Chinese engineers in Pakistan. During the mid-1990s, Mehsud fought with the Taliban in Afghanistan, losing a leg. In the fall of 2001, he was captured by Northern Alliance forces and sent to Guantanamo Bay where he spent more than two years before being released by the U.S. after he convinced interrogators he was an innocent Afghan. Here, three Pakistani journalists interviewed by FRONTLINE talk about Mehsud; all three describe him as unwilling and unlikely to make a deal with the Pakistani government. Editor's Note: Mehsud was killed in July 2007 in a confrontation with Pakistani police. According to Pakistani officials, he blew himself up with a hand grenade after being cornered. In this interview, published on Sikhspectrum.com in February 2004, Mehsud pledges to continue jihad against President Musharraf and the Pakistani army. In response to a question about the kidnapped Chinese engineers, he says, "All's fair in love in war." Who is Abdullah Mehsud? Tell us his story. Yeah, a very interesting character, I would say. I have not met him, but I've talked to him on the telephone. Speaks Urdu and a bit of English as well. … He has an artificial leg and rides a horse. A very convincing guy. He's hard to argue with. Gen. Safdar [Hussein] had had a couple of meetings [with him] and I asked him his impression. He said that this guy was motivated and he was the supreme commander of Mehsud militants from the Mehsud tribe. He was instrumental or helped organize the abduction of two Chinese engineers, workers from the Gomal Zam Dam; it's an irrigation hydroelectric project the Chinese were helping Pakistan to build. Then there was a commando action and one of the Chinese was killed. That was when Abdullah Mehsud really rose to prominence. He is still wanted, but is untraceable. But he had, before that, been wounded and captured in Afghanistan? Abdullah Mehsud, who had kidnapped two Chinese engineers ... he's still at large. He's not part of any peace agreement. This is after he was released by the Americans from Guantanamo. Oh yes. Abdullah Mehsud was captured by the [Northern Alliance] and American forces in Afghanistan and he was taken to Guantanamo. He was released and he returned to his village in South Waziristan and he took up arms against the Pakistan army. He inflicted lot of damage on the army, on the government. And in return the government also demolished some of his places. But he's still at large. This is a man who lost his leg in Afghanistan. I met him a few times and he is unrepentant. He's not surrendering. He is not signing any peace agreement with the government. The government says we won't sign a deal with him because he has killed his Chinese engineer. So, you know, one of his colleagues is now part of the peace agreement. Americans are going to ask why was he released from Guantanamo. Yes, the American people must ask as to why he was released from Guantanamo because that shows that the people who were being held in Guantanamo Bay, there was not enough information about them. It was a failure of intelligence, or maybe Abdullah Mehsud with his one artificial leg, they thought he can't do much. At that time nobody knew him, because he became famous after he came back to Waziristan. Then he became a commander. He would give speeches in the mosque, in the madrassas. In public meetings he would try to motivate the people to fight the Americans, the government, the Pakistan army. And that's how he became famous because they said, "Look, if this man with one leg can fight his enemies, why can't we?" So he was an inspiration for so many people. Did he tell you about his experiences at Guantanamo? He claimed responsibility for the attack on the Marriott Hotel here in Islamabad. Yes, that's right. He called me, you know. And he told me, "I have done this job. And I attacked the Marriott Hotel." We heard that there were reports that Robert Oakley, the ex-[U.S.] ambassador to Pakistan, he was supposed to be in the Marriott. There were other American delegation in the Marriott and his target was the American delegation who were in the Marriott. Did you believe Mehsud when he told you that he was responsible for the bombing?